Today's Mid Week Match-Up request comes from Arlow who writes: I want sports car that's fun to drive and won't leave me stranded too often. While I'm not a fan of convertibles as my DD, a 'vert might work here. I've looked at Alfa Spiders and of course there's the Miata. Currently my thinking is Miata is always the answer (I drove a Spider and decided that the idea of an old Alfa is way better than the reality of an old Alfa), but maybe I'm just not thinking far enough out of the box. It doesn't have to pull .98g's on the skid pad, but shouldn't wallow, either. Budget is 10K or under or maybe a little above for the right car. You could easily get a Miata or MR2 for under $10k that would do the job, but for my money I'm going to pick the red headed step child of the Porsche family. Like this 2002 Porsche Boxster S here on eBay bidding for $9,855 reserve-not-met located in Decatur, IL with 5 days to go. The 986 generation Boxster and Boxster S are great handling and decently quick machines that can be picked up for cheap. This car has had its ticking time bomb IMS bearing replaced and it looks ready for your commute. What do you recommend for Arlow? Comments below. I just sold my MSM. It took a while to find the right buyer, but it went to a guy in Seattle who will appreciate it as much as I did. +1 for MSM - those things are great fun. There's a great Best Motoring International (Japanese automotive show) dealing with this topic. It's on YouTube. They pit a bunch of interesting 2-door roadsters from the mid-oughts against each other on a track. I won't spoil the ending. Having just dealt with this exact conundrum (and made a purchase over the weekend) myself, here are my thoughts, in no particular order. My goals wereto have a fun summer commuter that might visit an autocross or novice track day a few times per season. 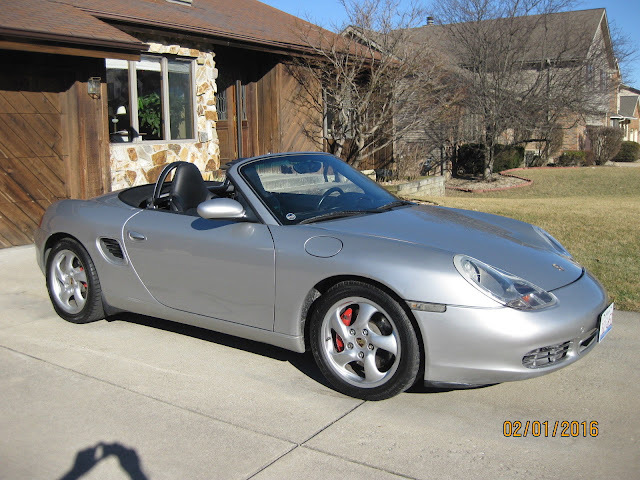 Boxster S - I'd go with '03 or newer as you get the glass rear window (no sun fade) and some other "facelift" niceties like clear tail lights. The LED lights in the photo above are aftermarket and I'd question if the rear end has been re-done. Expect to pay about 12 grand for an 03 or 04 example with just south of 100K. Expect to put in about $2,000 right off the bat in maintenance to fix the IMS and do a clutch/rear main seal while you're in there, plus other basic maintenance-y items. 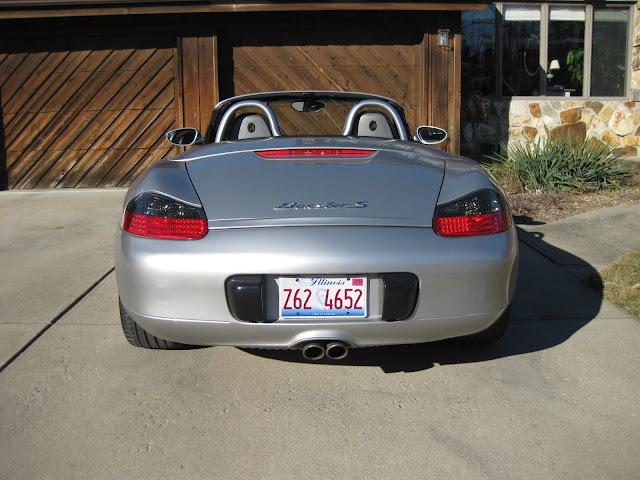 On the Boxsters the cars with fewer miles tend to have more problems, according to the forum gospel, so don't let the mileage on the odometer scare you. The 3.2's in the S's are less likely to have the IMS issue too (really affected the 2.7's more) so I restricted my search to S's only. I decided against the S because parts costs, even for a DIYer, are still high, and the mid-engine layout can make things a bit more difficult. Use the vindecoderz site to get a copy of the build sheet, and you can see exactly what the Boxster you're looking at has on board in terms of equipment. Honda S2000 - a good one will set you back $15K. I'd run far away from anything under that. Lots of these have been crashed/Fast and Furios'd (is that a term?) or salvaged out over the years, and finding a good clean stocker is possible but will cost more. Not as luxurious as some choices but a true roadster with Honda reliability. Miata/MX-5 - 10 grand gets you well into NC (07+) territory. It's no problem to find a nicely optioned Grand Touring with leather, folding hard top (or soft if you prefer), and all the toys in the budget. Personally I found the ride to be appalling, the seats uncomfortable, and the noise in the cabin unbearable. I rented a 2015 MX-5 hard top, grand touring (the last year before the re-style of this year) to go look at a car I did not end up buying that was 250 miles away, and the 500 mile round trip convinced me to avoid at all costs. Maybe I missed the point, but I like my creature comforts. Saturn Sky/Pontiac Solstice: I love the looks of the Sky. I restricted my search to Sky Redlines and Solstice GXP's with the turbo motors. The base models are fine but a bit underpowered. I ultimately decided against getting one, because the lack of any active or passive rollover protection meant I could not use it at my local track (YMMV). There is no aftermarket rollbar/roll hoop option either, so short of fabbing a cage, you aren't tracking one of these. If that's not important to you, I'd say go check these out. I loved the suspension feel on our cratered roads. BMW Z4 - my "ultimate" choice (see what I did there?) Easy to work on for the DIYer, parts are widely available and not too pricey, silky smooth inline six, and fantastic ride. Not a lot of them in the Midwest so they tend to be worse cars and the asking prices are higher. I had to go to Alabama to get mine. The biggest issue on these are various electrical gremlins and convertible top motors that like to grenade, so budget $1500 if and when that happens. Build quality is excellent, aftermarket support is good, has active roll hoops (so can be tracked), and it's a very pleasant place to spend lots of seat time (just drove mine 11 hours home and it was perfectly pleasant). The trunk is also huge for the class and can fit two golf bags. Cons? Well, unfortunately it has the reputation of being a hairdresser's car, and manuals are very rare. It's also not the best platform if you want to be class competitive in an autocross or trackday. Personally I'm fine sacrificing a little bit there to gain some everyday comfort, but that's me. Stick with a 3.0i only (I'd avoid the less powerful 2.5i) and with some patience you'll find one in your price range. Note that in '06 the higher-power version was the "si" and the 3.0i became the base car. As cool as the Z4M is, you're not finding one for under $19K and they are needier in terms of maintenance. Chrysler Crossfire. (I know, I know) Hear me out. The mechanicals are extremely reliable. Like bulletproof reliable. It can be had with a 6-speed manual or an automatic. If you want the auto, go for the SRT-6 with the supercharged v-6. Might be a little out of budget, but it's the cheapest way into the sub5 0-60 club. Hell, there's a cool Mondial listed on Long Island for only $3800. Is there any other more informed choice? The advantages of this "clean slate" Ferrari acquisition are limited only to one's imagination, line-of-credit or ability to borrow against your 401K. The choices mentioned above may be safer and more mainstream, but did you get to where you are today taking the safe, sane way? Oh, you did. I see, then all of the suggestions, except the Crossfire (just ain't right) are much, much better cars. BMW E46. M3 may be out of your price range but 330i or ci or cic would be in range. Check service records. Excellent online support if you are not afraid to do some work yourself. I just had a Gen 4 turbo swap with tasteful mods (intake, intercooler, exhaust, manual boost, etc.) dropped into my 91 MR2 and added some suspension upgrades. It's reliable, runs like a scalded dog, and terrifying. Highly recommended.